Here are the services happening in St Peter & St Paul’s this Christmas time. Everyone is welcome to join in any or all of the services. Please note the time changes in some cases. 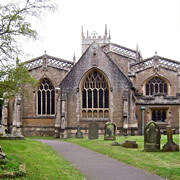 Wincanton Parish Church is seeking a new rector, and would value community feedback on what they want of their church and its rector. You are invited to complete a short survey to help them find the right person. 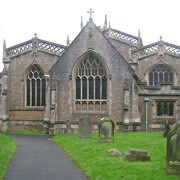 The Parish Church of St Peter & St Paul in Wincanton was burgled some time during the night of Friday 16th and the morning of Saturday 17th June 2017. 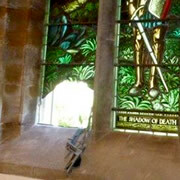 The forced entry caused damage to two of the stained glass windows. 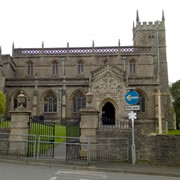 St Peter and St Paul's Church in Wincanton is holding an Easter garden and craft workshop in the church on Good Friday afternoon from 2:00pm - 4:00pm, for children accompanied by parents or carers. It's part of a nationwide event to promote heritage sites and buildings. 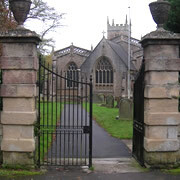 Wincanton has many interesting stories and historical events to choose from. This year we are linking our first Open Day to the new town Heritage Trail, launched late December, 2015. 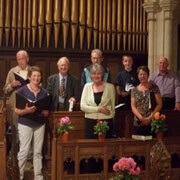 Would You Enjoy Singing With the Parish Church Choir? 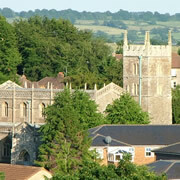 The Parish Church in Wincanton would like to increase its choir membership. If you enjoy singing and would like to join us, why not get in touch? 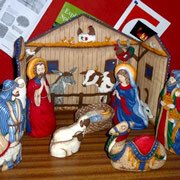 Practice evenings are on Thursdays at 7.30pm in the Church. Twenty five nativity sets brought by schools, individuals and churches made an engaging display in the Parish Church earlier this month. St. Margaret's Hospice will be holding a Light Up a Life service in the Parish Church, Wincanton on Saturday 12th December. This is an opportunity to reflect together, remembering family and friends who have illuminated our lives. 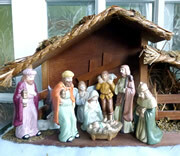 Wincanton Parish Church are holding a Festival of Nativity Scenes in the Church from Friday 11th to Sunday 13th December, created by local groups, organisations and individuals. Come and admire the displays. 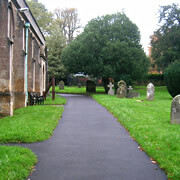 A Church Path Fete will take place at St. Peter & St. Paul’s Parish Church on Saturday 27th June. Free entry and lots of stalls, plus country dancing by the children of Wincanton Primary School. 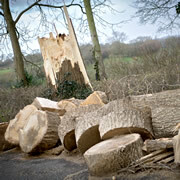 After much delay and frustration, work has now begun to repair the damage from one of Wincanton's more notorious recent incidents. 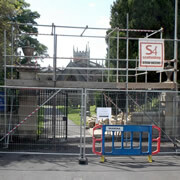 Repairs to the entry wall at St. Peter and St. Paul's Church, Wincanton, will take place over the next month or two. 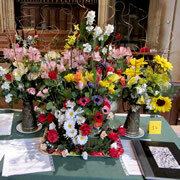 This year’s Flower Festival in Wincanton Parish Church really pulled out all the stops for beautiful and original displays. The theme this year was Celebration and the displays were made by members of a wide range of schools and organisations in the town. Volunteers from Wincanton Parish Church will be travelling around Wincanton in the lead up to Christmas, delivering Nativity scenes for a day or two in each home, and leaving a knitted sheep as a keepsake when it moves on. 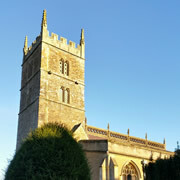 Wincanton Parish Church is holding a Christmas Tree Festival over a three day period. Everyone is welcome to come and support this event from 13th to 15th December. A programme of church services will be taking place during December. 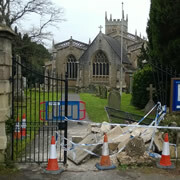 On Saturday 30th November a driver under the influence of drink drove the wrong way down Church Street, crashing into the gates at St Peter and St Paul’s Parish Church and causing considerable damage. 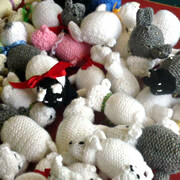 A sponsored Sheep Knit was held on Saturday 12th October, playing an important part in Wincanton Parish Church's Christmas Nativity and helping to raise money for the upkeep of the church building. A celebration fete took place at St Peter & St Paul's Parish Church on Saturday 8th June, the first of three events to mark the completed church roof repairs. The various fundraising events taking place on the day raised nearly £1,300. The evening of Saturday 8th June saw the Parish Church packed with people of all ages for what was a rather special event. A free concert to thank people for supporting the roof fund showed off much of Wincanton's musical talent. 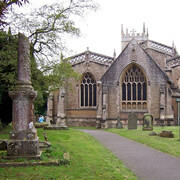 Repairs to the roof of Wincanton Parish Church have been completed. A day of Celebration and Thanksgiving will take place on Saturday 8th of June 2013.